Are the Everett Silvertips the best fore-checking team in the Western Hockey League? You likely won't get an argument from the Kelowna Rockets. The Tips used relentless pressure from its forwards in the offensive zone in a 2-1 overtime victory Wednesday night at Prospera Place. Dawson Leedahl scored the game winning goal 2:27 into overtime, snapping the Rockets nine game home ice winning streak. The Tips fore-check pressure didn't come occasionally, it was a constant. What was encouraging is the young Rockets d-core adapted to the pressure and faired remarkably well. Dealing with the pressure resulted in the forwards having to make a total commitment to defense and it likely wore the depleted home team down as the game went along. With six regulars out of the line, or essentially two of your top lines unable to contribute, the Tips wore down the home team by out-shooting them 20-6 in the third period. Goaltender Jackson Whistle, named the first star, made 20 saves in the third period to send the game into overtime. The fact that the Rockets were playing short staffed against a determined Tips team makes you think that one point in the O.T loss was a pretty good consolation prize. The Rockets had a chance to bury the Tips early but manufactured little in the way of scoring chances in three consecutive power plays. A third power play chance, awarded early in the second period, didn't even register a shot on goal when Tips d-man Noah Juulsen was fingered to the penalty box on a debatable interference infraction. Few scoring chances in the first period led to a two goal outburst 25 seconds apart in the second. Dillon Dube scored his 15th goal of the season with a nice wrist shot past Tips goaltender Carter Hart before the visitors tied the game a short time later when Graham Millar, the pride of Penticton, found the back of the net and the two teams were back on even terms. Should we be surprised these two teams settled things in overtime. In four meetings last season, two of the games were decided in overtime. Justin Kirkland was serving game two of a three game suspension while Riley Stadel was serving a one game suspension for a hit Monday against the Kamloops Blazers. The Tips are now 4 and 0 in overtime. The Rockets are 1 and 2 in the extra period. The Rockets end off the 2015 calender year with a record of 51-16-5-0. These two teams meet again in Everett on Friday to ring in the New Year. Kole Lind proved that he can score goals in the Saskatchewan Midget Hockey League. The Shaunavon, Saskatchewan resident scored 45 times with the Saskatoon Contacts last season. 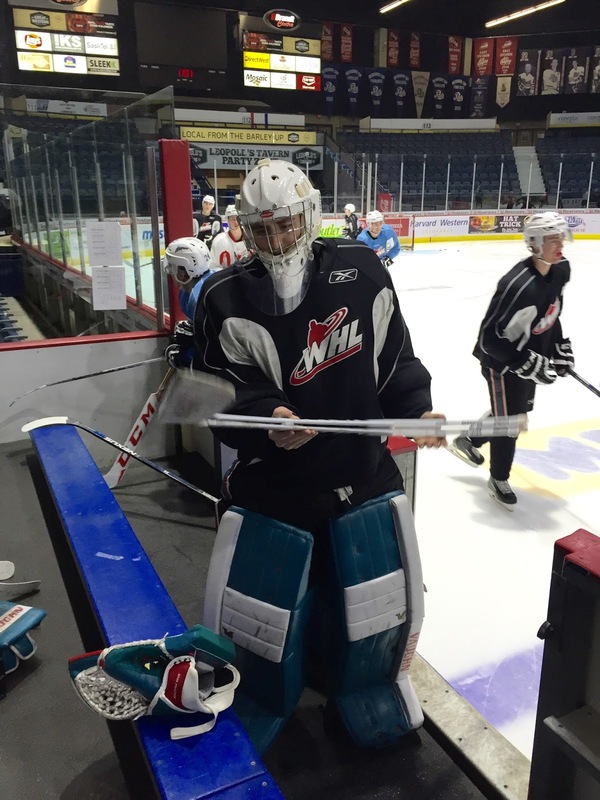 Now the 4th round WHL bantam pick is proving he can score at the next level. Lind scored three times Monday night in a 3-2 home ice win over the Kamloops Blazers. Lind, who has the luxury of playing on a line with league leading scorer Tyson Baillie and set up man Dillon Dube, scored his 11th, 12th and 13th goals of the season in the Rockets 13th home ice win. Lind was named the first star for his efforts. The well spoken forward has been named the first star in three of the last six games after collecting a goal and an assist in a 2-1 win Sunday in Kamloops before scoring a highlite reel goal and collecting two assists in Swift Current on December 15th. A typical tight hockey game between the Rockets and Blazers. It has been the theme over the course of the seasonal series. The Blazers are no push over. They are a good hockey team that will win more games then they lose in the second half of the season. The reason? The Blazers work hard and don't quit. Collin Shirley has been excellent this season and they have one of the best coaches in the game guiding them into battle. It all adds up to a winning formula. In four of the Rockets five wins against the Blazers this season, those games have been decided by a single goal. The two teams don't meet again until March 4th. The Rockets played this game without five regulars. The Blazers asked for supplementary discipline on forward Justin Kirkland after a hit Sunday on Kamloops defenceman Dallas Valentine. With Kirkland suspended Monday night, the team also played the game without Rourke Chartier, Calvin Thurkauf, Tomas Soustal and injured forward Rodney Southam. The Blazers also played shorthanded without Gage Quinney, Valentine and Patrik Maier (World Juniors). The biggest surprise on the night was the two starting goaltenders. I didn't think the Blazers had one with starter Connor Ingram single handedly dominating the crease in Kamloops this season. Jackson Whistle also took the night off after carrying the mail for the Rockets for the majority of the season. Michael Herringer was solid, making 37 saves in the one goal win. Blazers backup Dylan Ferguson was no slouch either at the other end of the ice. How good is Blazers d-man Dawson Davidson? Yikes. I remember how well he played as a 16 year-old affiliated player last season. Now 17, Davidson is crafty with the puck and reminds me a bit of Tyson Barrie. I don't see him enough to evaluate his defensive game, but what Davidson does around the puck at such a young age is impressive. That's a solid 3rd round bantam pick. Joe Gatenby was great on the blue line last night. It can't be understated. I would have given him a star in the building. The 18 year-old was especially good at getting into shooting lanes and blocking shots. What Gatenby has done in the first two games after the Christmas break has surprised me. Gatenby's set up of Kole Lind's one time goal Sunday in Kamloops was impressive and his slap pass to Tyson Baillie in the third period last night showed Gatenby's offensive awareness. You have to love Don Hay. Early in the third period, a gate/door malfunction at the Blazers bench resulted in a five minute delay. The off-ice maintenance crew were called in to address the problem. At one point, the door to the bench was literally pulled off its hinges in an effort to fix it. Hay didn't stand idly by though. The 61 year-old, at one point, had the entire door in his hands in an effort to aid the off-ice crew in making the necessary repairs. Hay, if given the chance, may have taken the power drill into his own hands if he was asked. I thought it was pretty cool that Hay, wearing his Sunday best, humbled himself enough to get involved in the minor repair. It honestly speaks volumes for the character of the man. How can you as a player not follow Hay's lead? Wow! The Rockets have won 9 straight games on home ice. The last loss came way back on October 30th. It matches the longest home ice winning streak of the season, set earlier by the Seattle Thunderbirds, who won 9 straight home games between October 3rd and November 27th. Last season the Rockets also won 9 straight homes before it was snapped in early November. How about the crowd? It was a sellout as 62 hundred strong welcomed the Rockets back to Prospera Place after a seven game absence. Up next is a date with the Everett Silvertips Wednesday night. The Tips have allowed a league low 74 goals against this season. 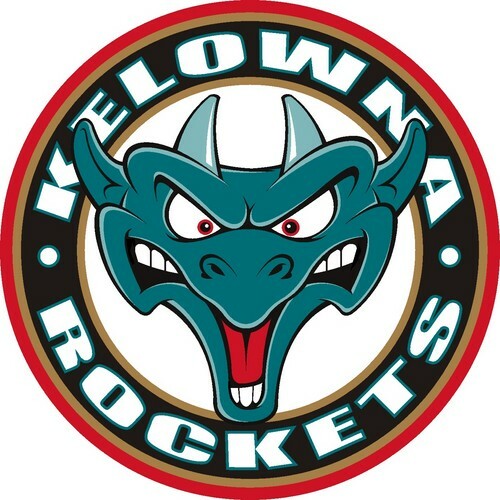 The league record for fewest goals against in a season is held by the 2003-2004 Kelowna Rockets. That season the team allowed an astonishing 125 goals against. Tonight’s Preview: The Kelowna Rockets close out the first half of the season (36 games) tonight when they face the Kamloops Blazers. The Rockets also play the final game of seven consecutive on the road. The team just completed a six game in nine night Eastern Division road trip prior to the Christmas breaking by winning three of six games. The team earned wins in Regina, Moose Jaw and Swift Current and suffered losses in Brandon, Prince Albert and Saskatoon. Following tonight’s game the Rockets return to Prospera Place for the first time since December 5th when they host the Blazers in the back end of a home and home series between the two BC Division rivals. After these two games against the Blazers, the Rockets won’t see them for another 27 games when they collide on March 4th. The Rockets have won 20 of their last 27 games overall (20-6-0-1) and are 12-2-0-0 on home ice and 13-7-1-0 on the road. Overall; the Rockets have points in 17 of 21 games (16-4-1-0). Overall, the team has won six of its last nine games but has lost two straight. Home Ice Success: The Rockets are riding an eight game home ice winning streak. The team’s last loss at Prospera Place was October 30th against the Prince George Cougars (2-1 L). In seven of those eight games, the team has scored four or more goals. In those eight home ice wins, the team has allowed three or more goals only once when beat Lethbridge 5-3. Oh Canada! Rourke Chartier is in Finland representing Canada at the World Junior Hockey Championships. The Rockets have been well represented at the World Juniors. Madison Bowey, Josh Morrissey and GM Bruce Hamilton came home with a gold medal last year from the prestigious tournament. Other notable players from the Rockets that have played for Canada include: Jamie Benn, Tyler Myers, Brandon McMillan, Tyson Barrie, Luke Schenn, Blake Comeau, Shea Weber, Josh Gorges, Chuck Kobasew, Brett McLean and Robb Gordon. Chartier is the 14th player from the Rockets to play for Team Canada. Seasonal Series vs. Blazers: Outside of one game, two of the three between the Rockets and Blazers have been decided by a single goal. The Rockets were a 4-3 winner on September 25th and squeezed out a 4-3 overtime win in their last visit to Kamloops on November 18th. Back on September 26th the Rockets earned a 7-3 victory at Sandman Centre. This and That: Tyson Baillie is playing in career game #295 this evening….Jackson Whistle played in five of the six games on the Eastern Division road trip. The only game he did not start was a 6-3 victory in Swift Current….Tyson Baillie’s hat-trick December 15th in Swift Current was the first of his WHL career in his 291st career game…The Rockets are rated as the 5th best team in the country after being ranked 4th best for four consecutive weeks in the CHL Top 10 rankings….Tomas Soustal is playing for the Czech Republic at the World Junior Hockey Championships.…Calvin Thurkauf is representing Switzerland at the World Junior’s….The Rockets play 12 games in December with 7 of those 12 on the road…Three members of the Rockets have been rated by NHL Central Scouting. Lucas Johansen and Dillon Dube are rated as ‘B’ prospects for June’s draft in Buffalo. Tomas Soustal, who was not selected last year, is ranked as a ‘C’ prospect…Rookie Gordie Ballhorn leads the Rockets with a +17 ratings….Nine of Justin Kirkland’s 12 goals have been scored on the road this season….Jackson Whistle has started 23 of the last 29 games…The Rockets receive relief from the schedule maker when they play 9 of 10 at home from January 19th to February 8th….Cole Linaker has 96 career points…Lucas Johansen is playing in career game #98. Who’s Hot: Tyson Baillie has points in 22 of his last 25 games……Justin Kirkland has points in 9 of his last 14 games. Kirkland has 4+12=16 over that period…Cole Linaker has points in 7 of his last 13 games. Linaker has 4+5=9 over that stretch…Dillon Dube has 12+16=28 in his last 21 games….Lucas Johansen has 11 more point this season as he did all of last year. Santa seems to visit the Kelowna Rockets during every pre-Christmas road trip. 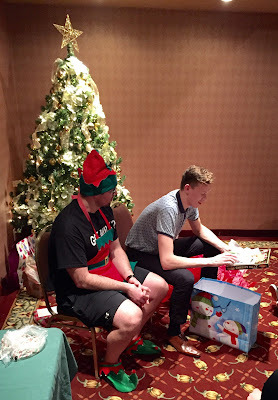 The team holds its 'Secret Santa' in a hotel banquet room where Christmas dinner is served and players buy gag gifts which they share with team-mates. Some of the gifts are inside jokes that I don't even get, while others are funny but inappropriate for this blog. The ones I will mention is Tyson Baillie unwrapping a gift that was leaking of water. It turned out, Baillie is the proud owner of a new gold fish. Rookie Cal Foote was given a white t-shirt with black sharpie writing on it that had in big bold letters 'Nice Guy #52' on it. I guess his team-mates are making fun of his polite demeanour. The shirt is appropriate. Foote is respectful to others and Adam and Jennifer, Cal's dad and mom, deserve major credit for guiding him as a person first and a hockey player second. Assistant Kris Mallette is always in the Christmas spirit by dressing up in some festive outfit while presiding over the event. I'm feeling old. I met Kole Lind's dad the other day. Man, he looked young. It is painful that now I look older than the players parents. It was awfully nice of Ashley and Marcia to invite the team to their Shaunavon home for a home cooked meal. I was really impressed by Swift Current Broncos Jake DeBrusk when I met him last week. I had to ask DeBrusk the white elephant in the room question of the trade rumours where the Broncos may move him to a contending team before or at the trade deadline. "I have been hearing a lot of stuff these days. While I am here I am focusing on the Swift Current Broncos. I know it is a possibility, but when I am on the ice, I am on the ice giving it my all. ", DeBrusk told me. DeBrusk added, "Every player in the WHL wants to win a Memorial Cup and I am no different". Speaking of the Swift Current Broncos, a high five to 'Butter', head athletic trainer Jamie LeBlanc. 'Butter', as he is known in WHL circles, always treats our team well when we arrive at the IPlex in Swift Current. Always with a smile on his face, he is happy to help visiting teams coming into town. It is quite impressive considering 'Butter' is a one man show. Most teams carry both an athletic therapist and equipment guy. LeBlanc...I mean 'Butter'....can do the job of two men! Great guy. Merry Christmas to him and his family. I've made this Saskatchewan road trip many times over my 21 years in the WHL. I have never seen this group of players so sick. Did they get flu shots? If they didn't...get them. If they did, avoid doing it next season. Sickness like this affects personal and team performance. I don't like to make excuses, but many players were playing excessively ill and playing short-staffed only made matters worse. As a broadcaster, I never get a flu shot. I am around the players and on the bus enough to get sick if I am not careful. My only plan to fight sickness are two things, washing my hands before I eat and taking vitamin C at the first sign of symptoms. Knock on wood, but I think it works! After saying that, I will probably get severely ill in January. How can Saskatoon have less snow than Kelowna? When I was there last week, you couldn't find a white flake on the side-walk. Gas in Saskatoon was 87.9 cents a litre. While on the road trip, I heard the price went up 12 cents a litre in Kelowna. How does that work? Drinking Starbucks in Swift Current. It felt like a dream. I lived in Swift Current for 32 years of my life where getting a latte was unheard of. Not any more! I remember in the 80's my father going to the Pioneer Coop coffee shop in the Wheatland Mall and getting a cup of 'Joe' for 75 cents. My latte at Starbucks costs five times as much. I am thinking of Ryan Huska and his family at Christmas. The winningest coach in Kelowna Rockets history is spending the festive season in California. Tough gig. On the prairie road trip, so many great interviews involving former Rockets now playing in Prince Albert and Saskatoon. I loved Jesse Lees' comment when I asked him about the trade from PA to Kelowna last December. The 20 year-old's honesty was refreshing. "That (the trade) was probably one of the hardest things I have had to do in my life. 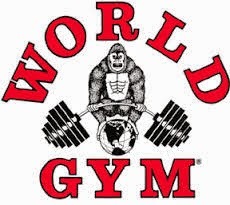 I was there since I was 16. I pretty much grew up there and matured into the person I am now. It was tough with the team we had and you could see the run they went on last year. I was happy for them but their was also that disappointment that I wasn't there for it". Austin Glover, also traded to Prince Albert in the Josh Morrissey/Gage Quinney deal, had some good comments when reflecting on the trade on December 10, 2014. "It was weird seeing the bus (Rockets bus) drive in to Prince Albert. The trade caught me by surprise. It was my first game back after spending a month injured, so my focus was more about getting back in the line-up and getting my feet wet again. It has worked out good for me. I am thankful for the opportunity I have been give here", Glover added. If you are a Eastern Division team, the travel for the most part is a breeze. A good example was the bus ride from Moose Jaw to Saskatoon. It took us a little over 2 hours. Let me point out that the road conditions were excellent and so driving at the posted speed limit was common place with no delays. Outside of games in Vancouver and Kamloops, the Rockets leave a day in advance of playing an opponent in the Western Conference. Speaking of driving...a high five to Kelowna Rockets bus driver Rick Windsor for the job he did on the trip getting us from city to city. No problems, outside of a small detour in Prince Albert, we made it flawlessly to every arena on time. Impressive, considering neither Windsor or any of the coaching staff (Ralph/Mallette/Crickard) had ever experienced the Saskatchewan road trip as a staff member. The Brandt Centre in Regina is still one of my favourite buildings to call a game. Great sight lines and the Western Pizza in the media room.....SO GOOD!!! Best player on the trip? I thought Reid Gardiner was very good in Prince Albert. Gardiner played hard and has high end skill. I thought he competed extremely hard. How is Rockets GM Bruce Hamilton spending Christmas? Hamilton is overseas visiting his son Curtis. Curtis Hamilton is playing with Sparta Praha in the Czech Republic. Hamilton is a team-mate of former Kamloops Blazers defenceman Marek Hrbas. I wanted to wish all of those that stop by and read my blog on a semi regular basis a Merry Christmas. Blog's are not what they once were with the development of Twitter, but it gives me a chance to inform fans of what is going on with the Kelowna Rockets without being forced to condense it into 140 characters. We will talk to you December 27th from Kamloops as the Rockets and Blazers renew acquaintances in what will be an exciting second half of the season. The Kelowna Rockets learned several lessons as they concluded an epic six game in nine night Eastern Division road trip. Teams won't take pity on them even with five regulars out of the line-up. The Western Hockey League leaders also learned they aren't good enough to win unless a determined effort is evident throughout the entire line-up. Despite building up a 2-0 first period lead in Saskatoon Saturday night, the Kelowna Rockets found themselves on the losing end of a 5-3 decision to close out the pre-Christmas portion of the schedule. The Blades had more 'want' with four-second period goals for only their 5th home ice win of the season against a team that - on paper - should have skated away with a win, fatigue or no fatigue. Kelowna Rockets assistant coach Travis Crickard, on the AM 1150 post game show said, "I felt embarrassed the way we came out in the second period in the way we played. Was it the worst period we have played all season? The answer was yes, probably top three". The Rockets ended the road trip with back-to-back losses for the first time this season after losing the previous night in Prince Albert by a 3-1 score. The team ends the Eastern Division road trip with 3 wins and 3 losses after winning three of first four games on the road trip through Saskatchewan and Manitoba. Cal Foote was ejected from the game in the second period after receiving a 5 minute major and game misconduct for a check to the head. The Blades would go on to score a power play goal - the game winner - with 5 seconds left in Foote's penalty while Justin Kirkland was also serving a penalty. The coaching staff suggested after the game that Foote's penalty didn't play a major momentum shift in the game. Tyson Baillie scored twice in Saturday's loss, but what became clearly evident on the road trip was the hockey clubs inability to find secondary scoring. Baillie scored five goals on the road trip and collected points in five of the six games (5+4=9). Line-mate Dillon Dube also had five points in six games (2+5=7) while Kole Lind, the third element on that line collected six points (1+5=6) in the six games. From there, the drop off was clearly evident. Crickard added on the post game show, "Our record, I could blame on fatigue, but I was really disappointed in our players willingness to grind out games and grind out wins." Crickard was referring to the teams success last season prior to Christmas on a similar trip to Alberta, where the team was winning despite making a trade with the Prince Albert Raiders that saw Austin Glover and Jesse Lees leave the team after the first game of the road trip. Other players were forced into new roles and the team was able to, as Crickard suggested, grind out wins. "When I think of this trip and the body of work from some of our players, especially depth guys who are put into roles that give them the opportunity to show the coaching staff, show their team-mates what they can do for the team, I just saw a bunch of guys that were happy to throw on a Kelowna Rockets jersey". The team scored 16 goals in the six games, with the Baillie, Dube, Lind line scoring half (8) of those goals. Justin Kirkland, a 19 year-old forward looking at signing an NHL contract, had three points during the trip (2+1=3) while 20 year-old Cole Linaker, after scoring once and collecting an assist in the opening game against Regina, failed to earn a point in the five remaining games. Lucas Johansen, who sits 8th in team scoring, had points in four of the six games (2+3=5) and was a consistent offensive contributor on the road swing. Johansen had a solid trip despite battling the flu bug. This was a chance for third and fourth line players to pick up the slack with Rourke Chartier, Nick Merkley, Tomas Soustal and Calvin Thurkauf attempting to make their respective major junior teams for the upcoming World Junior Hockey Championships. Tanner Wishnowski had just two points (1+1=2) with his lone goal in Swift Current coming into an empty net. Tate Coughlin had just a single assist on the trip. It was unfortunate that players that had the opportunity to step up didn't. The team was held to one goal in three of the six games. That is rare for a hockey club that at one point lead the league in goals scored. The Rockets lost 5-1 in Brandon, fell 3-1 in Prince Albert and earned a hard fought 1-0 win in Moose Jaw thanks to Jackson Whistle's first star performance. Of the 16 goals scored in the six games, four were on the power play and two were empty net goals (Baillie/Wishnowski). The power play went a respectable 4/22 (18%) while the penalty killing unity allowed 5 goals on 24 kills. Mitch Wheaton, playing the first game against his former team-mates since being traded to the Blades this summer, collected two assists in Saturday's win. That wasn't bad for a player who had just 6 assists in 32 games heading into a clash with his former team. The Rockets participated in the 4th 'Teddy Bear Toss' of the season in Saskatoon Saturday night. They were also treated to the same event in Regina and Brandon on the road swing. The Rockets also had a similar promotion against the Portland Winterhawks back on December 5th. Despite the 3-3-0-0 road trip, the team remains in first place in the WHL standings with 25 wins in 35 games. The Rockets have the most wins (25), fewest losses (9) and most points (51) which is good enough for a three point lead on the upstart Lethbridge Hurricanes. The team concludes a portion of their schedule where they play 7 straight games on the road when they visit the Kamloops Blazers December 27th for the 'unofficial' second half of the season. Often times, gutsy, greasy road efforts are rewarding. The Kelowna Rockets pulled off one such win last night in Moose Jaw. It makes any coach proud especially when players dig deep in order to win. With more than a handful of players ill, the Rockets played a smart, strategic game in a 1-0 victory over the home town Warriors. Playing without four regulars, the team received excellent goaltending from Jackson Whistle in the 27 save shutout performance. Dillon Dube had the lone goal, a power play one timer in the second period, and that's all the road weary Rockets would need. Blocking shots, playing smart and taking what the opposition gave them allowed the team to win for the third time in four attempts on this Eastern Division road trip. With two games left, tomorrow night in PA and Saturday in Saskatoon, the finish line is visible and the team needs to remain focused for 120 more minutes. The game in Moose Jaw was all about a goaltending battle between Whistle and Warriors netminder Zach Sawchenko. I knew life would be tough for the Rockets forwards against Sawchenko, who really impressed me when he represented the WHL at Canada/Russia Series in Kelowna back in November. Sawchenko was at his best last night and made several solid stops, specifically with his glove hand. He made many saves look easy when they weren't. You have to remember, Sawchenko is only 17 and is clearly a hopeful to represent Canada at the World Junior Hockey Championships down the road. If I was a NHL team, I would draft him in a heartbeat. I think he is that good. Whistle isn't as technically sound as Sawchenko, but his battle level may be better. Whistle just makes saves including a laser beam that hit him in the mask in the second period off a wrist shot from Warriors leading scorer Dryden Hunt. Whistle now has 9 career shutouts and never disappoints when he is in goal. Forward Rodney Southam was hurt when he was hit by a third period slap shot from team-mate Justin Kirkland. Scouts I have spoken with on this road trip are watching Dillon Dube and Lucas Johansen like a hawk. Many are coming away saying they like both players, with many asking me about Johansen specifically. I think Johansen has been excellent on this road trip, and despite sickness, is getting better every chance I see him. Johansen also carries himself like a pro. Certain players have that mature, confident demeanor and Johansen has that in spades. A solid communicator, I can't see how scouts wouldn't come away impressed when speaking with him. As for Dube, the draft eligible player has had good jump on this road trip with 2+4=6 in the four games. Jonathan Smart logged a significant amount of ice time in last night's win and didn't wilt under the pressure. I thought the 16 year-old handled himself wonderfully. That is one of the most interesting observations one came make on a road trip like this. You witness players either struggle with added responsibility or step up and play above expectations. Smart did just that last night. The game in Moose Jaw worked in the Rockets favour on so many levels. It took just two hours and five minutes to play. That my friends is a short and tidy game. For a team playing its fourth game in six nights, that is exactly the time line you are hoping for. The game featured very few scrums after the whistle and just four penalties. The Rockets power play had just one chance and scored. The Rockets are now 3-1-0-0 in the four games, having out-scored the opponent 12-11. The team will stay in Saskatoon over the next three nights, busing into Prince Albert for Friday's game and then returning to the 'Bridge City' to face the Blades Saturday night. In Saskatoon today, the wind is blowing lightly making it feel colder than it really is. A temperature of -8 with little to no snow in the down town core is a welcome sign. 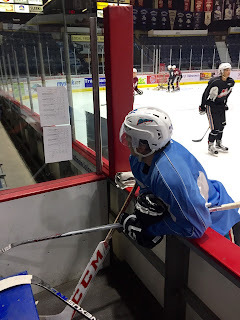 A character test for the Kelowna Rockets last night. The end result? More than just a passing grade for the defending WHL champions. Playing without four significant forwards, the Rockets dug out of a two goal deficit and earned a 6-3 win over the Swift Current Broncos. It wasn't necessarily a bad start for the Rockets, but a bad bounce that saw a puck go off a defenceman's skate and the Broncos had a quick 1-0 lead. The game wasn't even four minutes old. But instead of saying, 'here we go again', the Rockets scored the next five goals on their way to their 24th win of the season. Tyson Baillie ended the night with three goals while Kole Lind, essentially playing in his own backyard, had a goal and an assist and was named the first star. More on Lind in a moment. Tyson Baillie's three goal effort against the Broncos was the first hat-trick the 20 year-old has recorded in his career. It took the point producer 291 games to finally accomplish the feat. It is hard to believe it took Baillie that long considering the 266 points he put up prior to Tuesday's three goal effort. Sure, two of Baillie's three goals weren't exactly terrific, with one going in off a defender and another one into an empty net, but his power play one timer in the second period was a goal scorers goal. If you walked anywhere around the Credit Union I-Plex Tuesday night, you either ran into someone wearing a Kelowna Rockets sweater or someone wearing #16 with 'Lind' on the back. Kole Lind had a massive cheering section on hand for the game and the rookie forward delivered. Lind's lone goal came on a great individual effort to tie the score at two. It should be good enough to make the WHL plays of the week. In fact, I can guarantee it will. It was that good. Lind skated up ice with the puck from in front of his own net, made a nice move around a Broncos defenceman, cut towards the net on the forehand before tucking it past goaltender Landon Bow. A nice touch to see Lind's grandpa come up to the broadcast booth and shake my hand before the game. Despite battling illness, I thought Lucas Johansen was the Rockets best defender. Johansen makes excellent reads with the puck and did a great job of escaping danger when a Broncos forward tried to paste him into the corner boards with a solid hit. Johansen plays a smooth, calm game and was a really bright spot for a d-core that paid the price by blocking shots and playing with more snarl in their game. Of the nine goals scored in the game, no less than six were either bad bounce goals or empty netters. Baillie and Riley Stadel each had fortunate bounces go in while the Broncos had two of three goals either go off a Rockets defenceman's skate or shin pad. You can see why Broncos 20 year-old Jon Martin has 26 goals. Martin works hard, isn't scared to throw his big frame around and loves to shoot the puck. Receiving the third star, I agreed with his selection as the hardest Broncos forward to play against shift after shift. I thought Boston Bruins first round pick Jake DeBrusk had a very quiet game. I honestly expected more. With the Broncos trailing by two goals, head coach Mark Lamb put DeBrusk with Jon Martin and it seemed to make DeBrusk more lethal in the offensive zone. The 19 year-old, who is the centre of trade rumours and will most likely be dealt at the trade deadline, was a pleasure to speak with before the game. You can tell he has a pro mentality about him. Pencilled with the right line-mates, DeBrusk's 42 goals from last season are no fluke. A small Tuesday crowd at the Credit Union I-Plex. Just 17 hundred 68 fans took in the game which is below the season average of 1938. Up next is a date with the Moose Jaw Warriors. This indeed will be a match-up of the top two scoring 20 year-old's in the WHL. Tyson Baillie leads the league in scoring with 54 points, nine more than Moose Jaw's Dryden Hunt. Tonight’s Preview: The Kelowna Rockets play game three of an Eastern Division road trip tonight against the Swift Current Broncos. It is the lone meeting of the season between the two teams. Last season, in Kelowna, the Rockets were a 4-0 winner (Oct 7/2014). In the Rockets last appearance in Swift Current (Dec 10/2013), Ryan Olsen scored once and added an assist in a 4-2 win. The Rockets are 1-1-0-0 on the road trip after a 4-3 win in Regina Friday night and a disappointing 5-1 loss in Brandon Saturday night. Lucas Johansen had the lone goal in the teams 7th setback of the season in a rematch of last season’s WHL final. The Rockets have won 18 of their last 23 games overall (18-4-0-1) and are 12-2-0-0 on home ice and 11-5-1-0 on the road. Overall; the Rockets have points in 15 of 17 games (14-2-1-0). Following tonight’s game, the Rockets are in Moose Jaw (Wednesday), Prince Albert (Friday) and Saskatoon (Saturday December 19th). Overall, the team has won four of its last five games. Oh Canada! Nick Merkley and Rourke Chartier are off to Finland. Hockey Canada made several cuts on Sunday and Merkley and Chartier will fly with the team to the World Junior Hockey Championships. The Rockets have been well represented at the World Juniors. Madison Bowey, Josh Morrissey and GM Bruce Hamilton came home with a gold medal last year from the prestigious tournament. Other notable players from the Rockets that have played for Canada include: Jamie Benn, Tyler Myers, Brandon McMillan, Tyson Barrie, Luke Schenn, Blake Comeau, Shea Weber, Josh Gorges, Chuck Kobasew, Brett McLean and Robb Gordon. If Merkley and Chartier stick, they will be the 14th and 15th players from the Rockets to play for Team Canada. This and That: The Rockets have just three players on their roster (excluding Rourke Chartier from Saskatoon) from Saskatchewan in their line up on this road trip. Kole Lind is from nearby Shaunavon while Rodney Southam is from Saskatoon and Jordan Borstmayer is from St. Brieux…Riley Stadel returned to the line-up Friday night after missing 14 games with an UBI…For a third consecutive week the Rockets are rated as the 4th best team in the CHL Top 10 rankings….Tomas Soustal will attend the Czech Republic’s training camp in an effort to earn a spot on its World Junior team…Calvin Thurkauf will represent Switzerland at the World Junior’s….The Rockets play 12 games in December with 7 of those 12 on the road…Three members of the Rockets have been rated by NHL Central Scouting. Lucas Johansen and Dillon Dube are rated as ‘B’ prospects for June’s draft in Buffalo. Tomas Soustal, who was not selected last year, is ranked as a ‘C’ prospect…Rookie Gordie Ballhorn leads the Rockets with a +17 ratings…Rodney Southam is two goals shy from his career high 7 goals he scored last season…Cal Foote turned 17 on Sunday….Eight of Justin Kirkland’s 11 goals have been scored on the road this season….Jackson Whistle has started 20 of the last 25 games. Who’s Hot: Tyson Baillie has points in 18 of his last 21 games……Justin Kirkland has points in 7 of his last 10 games. Kirkland has 3+11=14 over that period…Cole Linaker has points in 7 of his last 9 games. Linaker has 4+5=9 over that stretch…Dillon Dube has 11+13=24 in his last 17 games….Lucas Johansen has 9 more point this season as he did all of last year. The 2015 Western Hockey League final between the Kelowna Rockets and Brandon Wheat Kings didn’t live up to its hype. Sadly, the rematch didn’t either. After sweeping the Wheat Kings last May for the Ed Chynoweth Cup, would the rematch be a better indication of how these two teams are essentially mirror images of one another? Nope! Like the league final, Saturday night’s game was one sided, but this time the Wheat Kings looked, and were, the superior team. A dominant first period saw the short staffed Wheat Kings own the puck for essentially the entire period. Honestly, it was that bad and arguably the worst period by the Rockets this season. Fortunately, despite chasing the play, the visitors only trailed by two goals after the opening period. · The game was essentially over after the Wheat Kings scored its third goal, 2:27 into the second period. Head Coach Brad Ralph contemplated pulling starter Jackson Whistle after that goal, but didn’t hesitate when the Wheat Kings made it 4-0 two minutes later. This loss wasn’t on Whistle. The support the veteran goaltender received in front of him was not exemplary of a first place team. The commitment to protecting the front of the net looked average at best and the Wheat Kings exploited the fact with four tip-in goals. That’s right, no less than four of the five goals saw a Wheat Kings player standing in front of the net and able to get a stick on a puck that was in midair. Rockets forwards were slow in getting into shooting lanes and defenceman were unable to tie up sticks. It wasn’t pretty. · For a third consecutive game the Rockets were involved in a Teddy Bear Toss game. Unlike what we saw in Kelowna and Regina, the collection of the stuffed toys was lengthy and prolonged the inevitable result. At games end, it is best to just walk away from it and hope it is a one off. With four more games left on this road trip, it is best to move on and put in a solid effort Tuesday against the Swift Current Broncos. 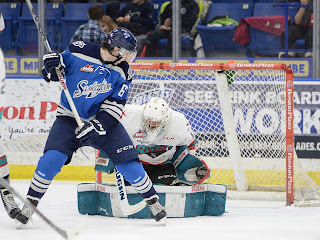 · As mentioned earlier, this game was a rematch of last season’s WHL final, but with massive changeover in junior hockey year after year, so many of the players that made an impact in May's series didn’t play in the rematch. In fact, 18 players that dressed for game four of the 2015 WHL championship didn’t play in last night’s rematch. Both teams were missing nine players’ aside. 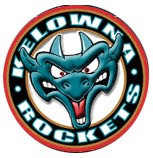 · The two best d-men wearing Kelowna Rockets colours were Cal Foote and Gordie Ballhorn. Outside of those two, it was tough to pick a player on the blue line that was above average. · Trailing 5-0, the Rockets appeared to get better in the second half of the game, but that may have been deceiving. With a significant lead, the Wheat Kings urgency level dropped significantly and the visitors managed to out-shoot them 26-16 over the final 40 minutes. That may have been the result of six power play chances where the team was unable to record even a single goal. Oddly, the only goal they would score against Wheat Kings Jordan Papirny came when Lucas Johansen beat the 19 year-old goaltender with a wrist shot high over his right shoulder with eight minutes left in the game. The shorthanded goal was the team’s second of the season. · The goal that told me the Rockets were in a heap of trouble on this night was the 2-0 goal from Tanner Kaspick. The Wheat Kings forward was allowed three whacks at the puck at the side of the net with goaltender Jackson Whistle flat on his belly with his right leg flush on the ice. Whistle forced his leg to the right post but no one was able to a) push Kaspick away by plowing him over by initiating contact b) tying up his stick so Kaspick was unable to will the puck into the net with no less than three pokes at it. It wasn’t like the Rockets were outnumbered in that situation either. They had three players in the general vicinity but Kaspick was still able to score. · A positive? Rookie defenceman Brayden Chizen was in his first career WHL scrap. It was a positive sign for a player that is extremely rough around the edges. If Chizen can use his size and power to his advantage, he could be a tough player to play against. Like Zdeno Chara, who played one season with the Prince George Cougars in 1996-97, the defender was anything but smooth on his skates but in time turned into a pretty good player. Chizen just needs time and good coaching in order to become a formidable force on the Rockets d-core. Tonight’s Preview: The Kelowna Rockets open an Eastern Division road trip tonight against the Regina Pats. The team will play those six games in 9 nights. This is the one and only meeting of the season between the two teams. Last season, the Pats earned a 3-1 victory at Prospera Place. Rourke Chartier scored the lone goal while Jackson Whistle made 33 saves in the setback. In the Rockets last visit to Regina, December 14, 2013, Myles Bell scored in overtime in a 5-4 win. Tyson Baillie had 1+3=4. The Rockets have won three straight games at the Brandt Centre. The last loss was a 4-3 setback on December 9, 2007 when Jordan Eberle scored the game winner. Luke Schenn and Jamie Benn scored goals for the Rockets in a losing cause. The Rockets have won 17 of their last 21 games overall (17-3-0-1) and are 12-2-0-0 on home ice and 10-4-1-0 on the road. Overall; the Rockets have points in 14 of 15 games (13-1-1-0). Following tonight’s game, the Rockets are in Brandon tomorrow night, visit Swift Current (Tuesday), Moose Jaw (Wednesday), Prince Albert ( next Friday) and Saskatoon (Saturday December 19th). Shot to the Heart: Since recording a season low 15 shots on net four games ago in Victoria, the Rockets have fired 151 pucks at the opposing goaltender, or an average of 50.3 shots on net in the last three games. Eight Is Enough: The Rockets are riding an eight game home ice winning streak. The team’s last loss at Prospera Place was October 30th against the Prince George Cougars (2-1 L). In seven of those eight games, the team has scored four or more goals. In those eight home ice wins, the team has allowed three or more goals only once when beat Lethbridge 5-3. World Junior Bound? Nick Merkley and Rourke Chartier have been named to the selection camp roster for Hockey Canada’s World Junior team. 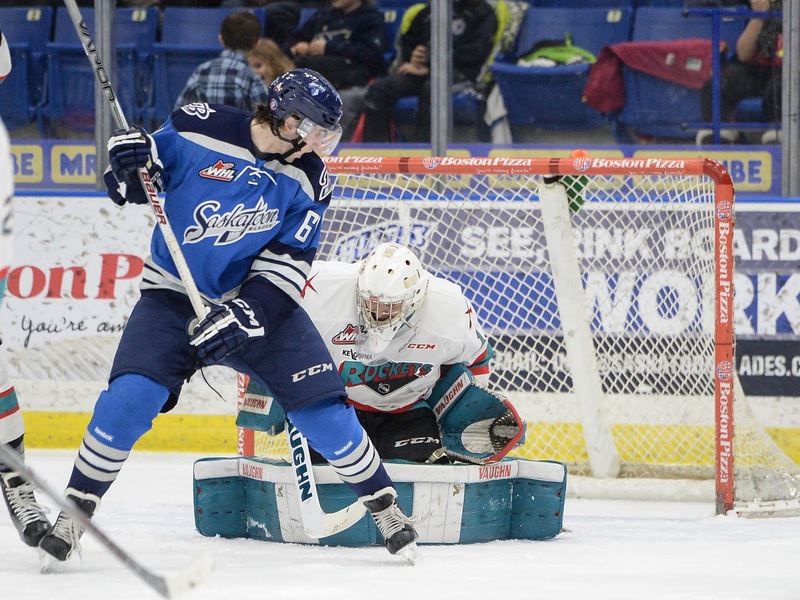 Both players attended the summer evaluation camp with Merkley playing for the WHL in the Canada-Russia Challenge last month in Kelowna and Kamloops. Chartier was unable to play because of injury. Ex-Rockets goaltender Jordan Cooke was named to the university team that will face Hockey Canada’s junior team in two exhibition games December 12th and 13th. The upcoming World Juniors Hockey Championships are in Finland at Christmas. This and That: Riley Stadel returns to the line-up after missing 14 games with an UBI…Tyson Baillie has 2+3=5 in two career games in Regina…For a third consecutive week the Rockets are rated as the 4th best team in the CHL Top 10 rankings….Tomas Soustal will attend the Czech Republic’s training camp in an effort to earn a spot on its World Junior team…Calvin Thurkauf will represent Switzerland at the World Junior’s….The Rockets play 12 games in December with 7 of those 12 on the road…Three members of the Rockets have been rated by NHL Central Scouting. Lucas Johansen and Dillon Dube are rated as ‘B’ prospects for June’s draft in Buffalo. Tomas Soustal, who was not selected last year, is ranked as a ‘C’ prospect…Rookie Gordie Ballhorn and Joe Gatenby lead the Rockets with a +16 ratings…Rodney Southam is two goals shy from his career high 7 goals he scored last season…Cal Foote is the next player to blow out candles. Foote turns 17 on December 13th.….Seven of Justin Kirkland’s 10 goals have been scored on the road this season….Jackson Whistle has started 18 of the last 23 games. Who’s Hot: Tyson Baillie has points in 17 of his last 19 games...Baillie had his 9 game point streak snapped last Saturday. Baillie had 6+11=17 over that stretch…Justin Kirkland has points in 6 of his last 7 games. Kirkland has 2+11=13 over that period…Cole Linaker has points in six of his last seven games. Linaker has 3+5=8 over that stretch…Dillon Dube has 10+11=21 in his last 15 games….Lucas Johansen has 8 more point this season as he did all of last year. Rockets arrive in Saskatchewan. Old man winter hasn't. Welcome to Regina. Why is it that weather always dominates the discussion on the prairies? Face it, it is a massive factor in day to day life out here. I am pleased to report the weather (knock on wood) has been unseasonable warm in Saskatchewan. No snow was on the ground when we arrived Wednesday night and the temperature was 6 degrees. The streets were wet from any precipitation that came down and people were dancing in the streets because of it. Ok, the dancing in the streets is a stretch, but non-farming folk here are pretty happy with the ability to wear just a 'Bunny Hug' when walking from the car to the mall. The farming community won't be happy with the lack of moisture though. Trust me, I heard for years how a lack of snow had a dramatic impact on the soil conditions. Whether you are growing fruit in the Okanagan or a grain crop in Saskatchewan, farming is weather dependent and with that comes the topic of the weather. The Rockets came in 'dry' when they arrived late last night in Regina after the lengthy bus ride from the Okanagan. We often joke, 'we are coming in wet' or 'we are coming in dry'. That is trainer talk which reveals if our team equipment is wet or dry under the bus after possibly having a practice, quickly loading the gear 'wet', and heading to our destination. Considering the Rockets came to Regina 'dry', there was no need to head to the Brandt Centre (the home of the Pats) before heading to the hotel for some significant sleep. The team had a quick practice at the Brandt Centre in Regina Thursday morning. I thought it was a pretty good pace considering the guys spent close to 14 hours on the bus. It was nice to see defenceman/forward Riley Stadel on the ice without a yellow jersey, signifying he is health to play. Stadel has missed 14 games with an upper body injury and will be playing in his 200th career WHL game tomorrow night against the Pats. The Rockets have two new faces joining them on this road trip. With Merkley, Chartier, Thurkauf and Soustal away, Alex Uryga and Connor Bruggen-Cate have joined the squad. Uryga is a listed player from North Vancouver while Bruggen-Cate is a 6th round bantam pick from 2014. The 17 year-old is from Langley, BC. Welcome to the prairies boys!! Unleaded gasoline in Regina is going for 91.9 cents a litre. Just say'n. Ya, I flew to Regina while the team took the bus. Would I do it again? In a New York minute. Either a lot of people live in Regina or they need another Starbucks location on the south end of the city. The Starbucks in Chapters resembles the Tim Horton's location near our hotel in Prince George. It is constant traffic with no quiet times. Starbucks makes a killing here! Jackson Whistle is making his third prairie trip of his WHL career. Tyson Baillie would also be experiencing the same thing. Whistle is upbeat about the trip, where he looks to everyone elevating their play. I look for Justin Kirkland, Dillon Dube, Tyson Baillie, Cole Linaker and Jackson Whistle making major impacts in order for the team to have success. Seems obvious considering all five of those guys are veterans. If those 'fab five' can play particularly well, this team has a good chance of coming away from this 6 game in 9 night road trip with a smile on their face. What I really want to see is some of the first year guys making major strides. How about Cal Foote? Kole Lind, come on down!! Let's see some of the rookies emerge on this swing. Hey, technically after you play 20 games you are no longer considered a rookie in the WHL. Is it a home game for Dillon Dube tomorrow night against the Pats? The 17 year-old played two seasons with the Notre Dame Hounds in Wilcox, Saskatchewan, which is located approximately 54 kilometres outside of Regina. We will talk to you on the radio at 4:30 BC time tomorrow afternoon from Regina. The two hour time difference, while not dramatic, does take some getting used to. The game locally starts at 7 pm, which is 5 pm Kelowna time. Kelowna Rockets second year defenceman Lucas Johansen will experience something new when the team heads out on an epic 6 game in 9 night Saskatchewan/Manitoba road trip. Johansen has never made the voyage, which the team schedules prior to Christmas every second season. "We are all excited for it. The only thing we are not excited for is the bus trip, which is about 14 hours." Johansen is right. The bus trip from Kelowna to Regina is just shy of 14 hours. Thirteen hours and 50 minutes in fact if you believe Google Maps. The team will make stops in Regina, Brandon, Swift Current, Moose Jaw, Prince Albert and Saskatoon. When the bus rolls into Saskatoon on December 19th it will have travelled three thousand, 22 kilometers. The bench mark has been set by the Victoria Royals. The Royals completed an Eastern Division road trip earlier this season going a perfect 6-0-0-0. It was nice to shake the hand of Michael Barnett the other night in Kelowna. I was surprised to see the father of J.T Barnett at Prospera Place, until I was informed by Michael that he is making a quick stop in the Okanagan as the Rangers make a Western Conference road trip. A common theme with Michael Barnett is a firm handshake, a smile and always positive words. Barnett is the senior advisor to the President and General Manager of the New York Rangers. Cal Foote will celebrate his 17 year-old birthday in....wait for it.....Swift Current, Saskatchewan. Foote celebrates the milestone on December 13th, a day after his team plays the Wheat Kings in Brandon. If it makes you feel any better 'Footer', I too celebrated my 17th birthday in Swift Currrent. The Rockets have only three Saskatchewan born players on their roster. With Rourke Chartier trying out for Team Canada, Rodney Southam (Saskatoon), Kole Lind (Shaunavon) and Jordan Borstmayer (St. Brieux) will be waving the Saskatchewan flag proudly. Athletic Therapist Scott Hoyer is from Regina. The Rockets last made the Saskatchewan/Manitoba road trip in the 2013-2014 season when they went 6-0-0-0. In 2011-2012, the team had a mark of 3-2-1-0 in six games. In 2009-2010, the hockey club was 3-3-0-0. In 2007-2008, the hockey club played only five games (3-2-0-0). The team's trek to Saskatchewan to play Eastern Division teams hasn't always been scheduled for December. During the 2005-2006 season, the team headed East in October and promptly won all six (6-0-0-0) games. In the 2003-2004 season the team was also undefeated on the trip with 5-0-0-0. The only team they didn't play that season was the Swift Current Broncos. Things to look forward to on this road trip? A date with the Brandon Wheat Kings in a rematch of last seasons WHL final. Both teams will be short staffed. Four players on the Rockets side won't play because of world junior commitments while the Wheat Kings will be missing three key players. It will be interesting when the team visits the Prince Albert Raiders in the fifth game of the six game road trip. The two face one another for the first time since Austin Glover, Dalton Yorke and Jesse Lees where traded to the Raiders in two separate deals for Leon Draisaitl, Gage Quinney and Josh Morrissey. It will also be a chance to see former Rockets head coach Marc Habsched, who is guiding the Raiders now. They played together in Kelowna for one season and now they have been reunited in pro hockey. Cole Martin and J.T Barnett are team-mates with the East Coast Hockey League's Atlanta Gladiators. Here are some comments from Adam Foote, the father of Rockets rookie defenceman Cal Foote on why his family chose the Western Hockey League for his two sons. "I wasn't sure which route he was going to take. The WHL is a great development league and we are fortunate for him to be in a great organization and a great city. I grew up playing in the OHL and my dad knew David Branch. We just thought staying out West would be a good fit and they love it". Adam coached Cal for four seasons before making his jump to the Western Hockey League. "I couldn't be happier to see where he is going to develop". Cal Foote could be joined by his younger brother Nolan as early as next season. Nolan was the Rockets first selection on May's WHL bantam draft. "He won't get much love from the NCAA this winter. 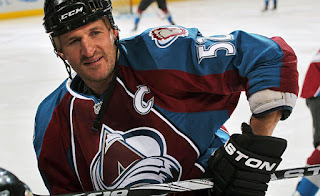 He definitely wants to be a Rocket", Adam Foote added. The Rockets have a planned 'social outing' on this road trip. The team plans to head out to Shaunavon, Saskatchewan for a meal put on by Kole Lind and his family. I've made a connection with Jordan Cooke. I am hoping the Saskatchewan Huskies goaltender will join me in the first intermission (on the radio) of the December 19th game in Saskatoon. Bears, be aware of Dube!! Be aware of bears. Or should the sign read - 'Bear's beware of Dube'? 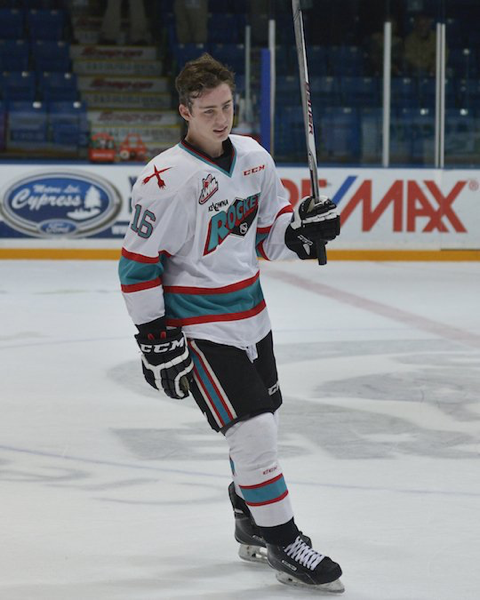 For a second consecutive season, the 17 year-old forward fired home the 'Teddy Bear Toss' goal in the Kelowna Rockets 4-2 win Saturday night over the visiting Portland Winterhawks. Dube's one timer from the right face-off circle opened the scoring with 8 seconds left in the first period, prompting the crowd of 53 hundred to begin throwing stuffed toys on the ice. Dube wasn't done there though. The draft eligible player scored his second goal of the game, the game winner in fact, at the midway point of the second period when he found himself alone in front of the Winterhawks net. Despite fanning on the shot, it squeaked through the legs of Portland goaltender Adin Hills legs to give the home team a 3-1 lead. Joe Gatenby would provide some insurance in the third period as the Rockets won their 8th straight game on home ice. It was Dube's fourth - two goal game this season. It also snapped an 8 game goalless drought. Speaking of players that were duo to score, Joe Gatenby would fall into that category. Gatenby scored his first goal of the season with a blue line blast in the third period. It was Gatenby's first goal in 43 regular season games dating back to last season. Gatenby's last goal prior to last night came against Kamloops back on February 18th of last season. Jackson Whistle earned his 83rd career win, moving into a tie with Kelly Guard for second place all-time with wins as a Kelowna Rockets goaltender. 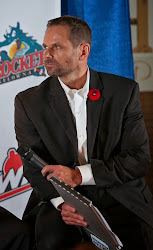 Whistle has 84 career wins, but one of them came as a member of the Vancouver Giants before being traded to the Rockets for a third round draft pick. Whistle is now 9 wins shy of tying Jordan Cooke for first place - all time - in wins by a Kelowna Rockets goalie. Undoubtedly, Whistle could hit the 100 win plateau by seasons end. How impressive would that be? The WHL record book does not keep track of most wins in a career by a goaltender. WHL goalies that come to mind that have had winning careers with the same team include Tyson Sexsmith (120 wins with Vancouver) and Mac Carruth (117 wins with Portland). Tristan Jarry (93 wins), Calvin Pickard (91 wins with Seattle) and Eric Comrie (85 wins) are also good examples of winning games with the same franchise. Tyson Baillie had his 9 game point streak snapped against the Winterhawks. The WHL leading scorer missed a golden opportunity in the second period on a two-on-none breakaway with Dillon Dube. Dube elected to pass to Baillie who fired the puck into the left pad of Hill. Best player on the ice for the Winterhawks was Caleb Jones. I thought the Edmonton Oilers 4th rounder got better as the game went along. I didn't notice him much in the first period but did he ever play well in the second and the third. Terrific player with the puck. The Rockets conclude a three game home stand winning all three games and out-scoring the opposition 13-5. The team now has 12 wins on home ice this season and own the best record in the WHL with 22 wins in 29 games. The Rockets have the third most wins in the entire CHL. Only Erie (25) and Rouyn-Noranda (23) have more victories. The Rockets 8 game winning streak at home is the second longest in the WHL this season. Seattle had a 9 game home ice winning streak snapped November 28th with an overtime loss to Moose Jaw. The T-Birds haven't lost in regulation time on home ice this season (10-0-1-0). The Rockets longest winning streak at home last season was 9 games. Up next? A six game road trip through the Eastern Division. More on that in a future blog entry. Max Gerlach's missed chance on a first period power play proved lethal last night for the visiting Medicine Hat Tigers. With the struggling Tigers carrying the play for the first 13 minutes, Gerlach was involved in a pretty three way passing play. The puck was on his stick with a wide open net staring him in the face. Instead of firing it in with easy, Gerlach's shot hit the post and it stayed out. Eventually the Kelowna Rockets came alive, receiving two goals from Cole Linaker in a 5-2 win. While the Rockets extended their home ice winning streak to seven games, the Tigers dropped their eighth straight on opposition ice. Had Gerlach scored, how would the complexion of the game changed and ultimately the end result? That was a tough miss for a team that has only seven wins this season. The Rockets appeared to get better as the game went along and also received solid goaltending from Michael Herringer. Herringer fought the puck in warm up and looked as sleepy as his team in the early going before making several strong saves. Herringer's glove hand, specifically, was terrific on several occasions. The 19 year-old would end the night with a 34 save performance and third star in the building. Cole Linaker had two goals, giving him 11 on the season. Not bad for a defensive forward who had a career high 14 goals in 2014-2015. Linaker should be able to score no less than 20 goals this season, which would be impressive for a player who had 27 career goals coming into the season. Lucas Johansen was seen joining the attack several times over the course of the game and was rewarded with a goal when he was left unattended in the slot to make the score 5-0. Cal Foote also scored, giving the Rockets some much needed goal production from the d-core. Does 17 year-old David Quenneville not have one of the best shots in the league? Quenneville's slap shot is heavy and his wrister is equally good. The only thing holding him back is his 5'8 frame. Cole Sanford, a 50 goal man from last season, had little time to make an impact. The 20 year-old received a 10 minute misconduct in the second period and didn't return for the third period because of an injury. Sanford has to miss Trevor Cox as his line-mate in Medicine Hat. Those two were a scary combination that Tigers head coach Shaun Clouston used without hesitation. Cox was traded to Vancouver after apparently asking for a trade. Tyson Baillie just keeps scoring. The 20 year-old is riding a nine game point streak with 5+11=16 over that period. The longest point streak in the WHL is 11 games set by Swift Current's Jon Martin. Leon Draisaitl had the longest Rockets point streak last season (13) followed by Nick Merkley (12). The Rockets have won 7 straight games on home ice. During that stretch, the team has only given up three or more goals once (5-3 win vs. Lethbridge). The team has also scored four or more goals in six of the last seven games. Up next is a home game against the Portland Winterhawks tonight on 'Teddy Bear Toss' night. It is the final home game before Christmas as the team heads out on a seven game road trip which includes a six game 'roady' prior to sipping on egg nog. Tonight’s Preview: The Kelowna Rockets play game two of a three game home stand tonight against the visiting Medicine Hat Tigers. This is the second meeting of the season between the two teams. The Rockets were a 6-5 winner in Medicine Hat back on October 6th. The Rockets had six different goal scorers in the one goal victory. Nick Merkley scored the game winner with under 5 minutes left in regulation time. The Tigers make a return visit on January 23rd. The Rockets are coming off a 4-1 win Wednesday night over the Kootenay Ice. Rourke Chartier scored three times. Justin Kirkland scored his 10th goal of the season in the lopsided affair, which saw the Rockets fire a season high 59 shots on net. The Rockets have won 15 of their last 19 games overall (15-3-0-1) and are 10-2-0-0 on home ice and 10-4-1-0 on the road. Overall; the Rockets have points in 12 of 13 games (11-1-1-0). The Rockets home stand continues tomorrow night against the visiting Portland Winterhawks. This and That: The Rockets have won 6 straight games on home ice….Cole Martin was involved in an ECHL trade this week. Martin, who led the Rockets in +/- last season, was dealt by the Idaho Steelheads to the Atlanta Gladiators. Back in November, Chance Braid, who started his season with Martin in Idaho and is a former member of the Rockets WHL championship team, was sent to the Allen Americans for future considerations...For a second consecutive week the Rockets are rated as the 4th best team in the CHL Top 10 rankings….Tomas Soustal will attend the Czech Republic’s training camp later this month in an effort to earn a spot on its World Junior team…Calvin Thurkauf will represent Switzerland at the World Junior’s….The Rockets play 12 games in December with 7 of those 12 on the road. That includes a Saskatchewan/Manitoba road trip that begins next Friday in Regina and ends December 19th in Saskatoon. The Rockets will play those six games in 9 nights… Three members of the Rockets have been rated by NHL Central Scouting. Lucas Johansen and Dillon Dube are rated as ‘B’ prospects for June’s draft in Buffalo. Tomas Soustal, who was not selected last year, is ranked as a ‘C’ prospect…Baillie has points in 15 of his last 16 games…Baillie has been held off the score sheet in just five of 27 games this season…Rookie Gordie Ballhorn and Joe Gatenby lead the Rockets with a +14 ratings…Rodney Southam is two goals shy from his career high 7 goals he scored last season…Cal Foote is the next player to blow out candles. Foote turns 17 on December 13th.….Seven of Justin Kirkland’s 10 goals have been scored on the road this season….Jackson Whistle has started 17 of the last 21 games…Tyson Baillie has averaged 28 goals over his last three seasons…The Rockets next play three games in three nights January 29th, 30th and 31st with two of those three games on home ice…. Who’s Hot: Justin Kirkland has a 6 game point streak with 2+9=11 over that period…Cole Linaker has points in four of his last five games. Linaker has 1+4=5 over that stretch.…Nick Merkley has points in five of his last six games. Merkley has 3+5=8 over that period…Tomas Soustal has two more points (20) than he had all of last season….Tomas Soustal has points in five of his last seven games. Soustal has 4+3=7 over that period…Kole Lind has 4+4=8 in his last 10 games…Tyson Baillie has 11+25=36 in his last 19 games …Dillon Dube has 8+11=19 in his last 13 games….Lucas Johansen has 6 more point this season as he did all of last year.